The New One made it three wins in as many starts this term with victory in the International Hurdle at Cheltenham. Early leader Zamdy Man was reeled in by The New One and Vaniteux, with Sam Twiston-Davies's charge going on to win by four-and-a-half-lengths. "He's excellent," said jockey Twiston-Davies, son of trainer Nigel. "Coming into the race, we had to win it to become a Champion Hurdle contender. "He wasn't flashy, but when he comes to the track he does what he needs to." The New One's stablemate Mad Moose was set for his first outing in over a year after being banned for refusing to race on numerous occasions, but the veteran once again dug his heels in at the start and took no part. "This was one of The New One's very best performances. He jumped impeccably and powered home, kicking aside a decent quality opponent, who was being conceded eight pounds. The horse is not necessarily getting any better, but he is perhaps getting luckier. "That's not to say his three victories this season have been in any way lucky, but that element of good fortune needed by all athletes in competition - which at times deserted him last season - is at the moment in full supply." Aidan Coleman earlier led Niceonefrankie from the front to win the Caspian Caviar Gold Cup. The 16-1 shot, trained by Venetia Williams, defied a hike in the weights to beat Barrakilla by six lengths. Edgardo Sol finished third, while the Paddy Power Gold Cup winner Caid Du Berlais was pulled up midway. "Every time you come to an obstacle he makes you look good - I'm not doing anything but sitting on him," Coleman told Channel 4 Racing. "He's bull ignorant and not the most mannerly of horses, but he has the heart of a lion." 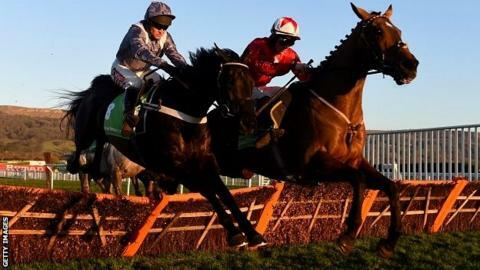 "Venetia Williams is perhaps better known for quantity rather than quality, even though she did, of course, win the 2009 Grand National with Mon Mome. Her best horses - chaser Teeton Mill and long distance hurdler Lady Rebecca - were both in action a few years ago now. No one doubts she can get the job done well, but the fact is that in these times when who's fashionable dictates so much, the top material tends to go elsewhere, so this big-time moment was very sweet."